I’ve written about Daniel before. I love this book of the Bible. One of my favorites for SO many reasons. The guy’s name means “God Is My Judge” and when I get into the book depicting Daniel’s life and prophecies, I can see how it fits him. Here’s a guy who was committed to doing what was right, no matter whom he upset as long as he pleased God. Hey, Daniel wasn’t at all worried about being judged by anyone else. Confident. The book is written in a variety of styles. For example, there are stories of stand-up kind of guys who just weren’t going to be pressured into disrespecting God. 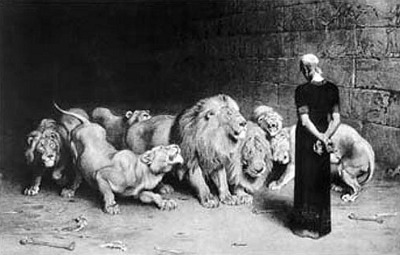 Think Daniel and the lion’s den. Oh, and how about the fiery furnance? Those famous stories of the Bible came from Daniel. But the book of Daniel isn’t just about true stories – Daniel had some incredible prophecies. He interpreted dreams. He could see past this old world and into the new heaven and earth. People read Daniel and get ideas about how the end times will happen. I usually think of someone who writes a book of the Bible as somebody like a pastor or prophet. But for Daniel, well, he was a politician. He grew up with a great sense of discernment and wow…a conscience that would make momma proud! With the opportunities that came to him because of his ability to interpert things, he actually got to see his legal system work within the walls of the king’s castle and I learn that is where he became such an influence. You know, when I learn that about Daniel’s life, I’m reminded that God uses people in whatever line of work they happen to be in. I mean, if it’s a courtroom, a pulpit, the governor’s mansion…you know, God works through us when we are simply faithful to His call.